My part in the downfall of everything. And blooms in the Nativity of Time? The rest of a Zionist delegation. And shavings fall,” said Goering. To be pretty closely related? This was a kinship to be exploited. Sturdy in stature, if in separate lands. Send us off, please, begged the eager Zionists. The Reich was half-inclined to let them go. Recognising power’s “aura”, blest indeed! But yours in essence, birthright of your race. With fellow Brits in it during the Mandate. The “cattle” of the Holocaust. A sabra spirit ripened, armed with spikes. The prickly pear epitomised these kikes. More at one with the sword than with the slain. While bound as in a tryst to some new Axis. Progress of that leaking barque Democracy. Dark union of Mossad, the C.I.A. Into the field of ever blacker ops. His torches – blamed for setting all aflame. A view that appeals to the powerful now. All that’s asked for is to be devout. On those you use for torches. Be devout though solely in your aim. You have a goal. Pursue it. Serve your god. But after all, your god is Mammon. As vast as the pit is bottomless? Taken out of incubators, causing them to die. The rest of us with this concocted crime? All go along with the protocols of the Elders. By “Kamikaze” pilots, human drones. Or was the myth a slander from the start? More than likely set up by the Lionheart. Play by their opponent’s rules. Of the foe, doctoring the evidence. The truth being simply what one cannot know. The ransack of another sovereign land. Gag protest – in the name of (your) democracy. Petty sins, white lies, but little more. While we try on garments in the mall. Enemy’s enemy can become your pal. Themselves, each at a neighbour’s throat? Restoring it, our Herculean task. And harems aren’t laid on for one in Paradise. Since its heyday in the seventeenth and eighteenth centuries, satire as a poetic form has fallen out of fashion. Of course, in other fields, there are still plenty of satirists. Private Eye continues to mock the establishment and spill the beans on cheats. Stand-up comics ridicule our politicians and media stars. There are plenty of films, plays and musicals that deal in derision and the criticism of human pretensions, foibles and iniquity. The satirical vein is still very much in circulation. But poetry itself, the principle organ of mockery in Roman times, appears to have lost sight of this cutting tool with the advent of the romantics. Sincerity replaced wit as the yard stick in the nineteenth century, and resonance achieved through depth of feeling became a more urgent concern. Then, in its turn, modernism reacted to this humanisation of the world – perceiving its emotional relationship to experience as dangerously persuasive: a form of rhapsodic exhortation that could be used to enlist youth in the projects of empire; and so romanticism gave way to the experimentation of the twentieth century, with its emphasis on the material nature of the medium, and then came the social commitment of the thirties that established a return to narrative, which led to the milieu splitting into camps advocating language or concern. And these days, in the age of creative multitudinousness, there are a host of post-modernist varieties to choose from, and plurality seems to prevail. However, while ranting has come into its own, there is not much in the way of satire. Clive James is one of its few exponents in contemporary poetry. Observing this, I found myself returning to Dryden’s Absalom and Achitophel, a satirical masterpiece, in which the poet develops an extended metaphor replacing the events of his own time with an incident drawn from biblical history that comes alive thanks to his brilliant gift for portraiture. This has inspired me to try my hand at the genre, though admittedly I have adapted it to my own sense of contemporaneity and the requirements of today’s “ear”, as I see them. I felt no desire to write in rhyming couplets or in a form demanding strict metrical regularity. To do so would be to hark back too directly to the achievements of the seventeenth century, producing an imitation that would come over as a cliché. Instead I decided to work with a five-line stanza which may sometimes use rhyme without fixing on a scheme – and this owes something to the verse of F. T. Prince. What does seem important to retain though is a sense of one’s subject. With satire, there is a beast in view. It might be a satire “On the monarchy” or “On religion” or indeed “On love”. My subject is derived from a fascination with shady deals and my unwillingness to take very much at face-value. Spike Milligan’s writing helped me with the title and with a way of setting about the project. — A.H.
Anthony Howell, a former dancer with the Royal Ballet, was founder of The Theatre of Mistakes and performed solo at the Hayward Gallery and at the Sydney Biennale. 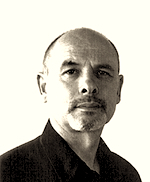 His articles on visual art, dance, performance, and poetry have appeared in many publications including Art Monthly, The London Magazine, Harpers & Queen, The Times Literary Supplement. He is a contributing editor of The Fortnightly Review. In 2001 he received a LADA bursary to study the tango in Buenos Aires and now teaches the dance at his studio/gallery The Room in Tottenham Hale. He is the author of a seminal textbook, The Analysis of Performance Art: A Guide to Its Theory and Practice. Details about his collaborative project, Grey Suit Online, are here. This Fortnightly Review article is filed under the following rubrics: Occ. Notes, Politics & Culture. Publication: Friday, 8 May 2015, at 14:14.